It’s amazing how expectations can colour a person’s perception of a thing. “I expected X and got Y so Y was automatically bad” is a thing. I am usually able to set aside that sort of feeling and enjoy a thing on its own merits. I’ve lived through enough iterations of the Teenage Mutant Ninja Turtles that Michael Bay’s version didn’t phase me. (Similarly, his Transformers was a steaming pile of CGI Crap on its own merit or lack thereof.) Anyhow, It took a bit of time to reconcile my expectations of this as a “holiday game” and my experiences with it as just a party game. As a party game, this can be a ton of fun. Everyone gets a big plastic nametag with their character on it, and well as their character’s rule. The starting player chooses another character to talk to, as well as a Judge. The Judge makes up a scenario to explain why these two characters are talking, and then each player has 30 seconds to talk to each other. Players should try to stay in character and should try to follow the rule for their character. I say “should” because ultimately it is the Judge who will decide who wins the round. After that the next player at the table becomes the starting player, they choose a new character to talk to and a new Judge. At the end of each round, the Judge can choose to make any player keep their character, draw a new one at random, or trade their character with another player. The game ends when a player wins three rounds, or whenever the group decides to move on. If this was a review of just Party People, I would end there and say this is a great game. If this was just Party People and an envelope of 5-10 holiday characters you could add to your game, I would probably be raving about it. But it’s not, this is Party People Holiday Edition. If you’re going to label a game a holiday edition, make it a holiday edition. Of the 20 characters in the game, only six are at all festive, and only two of those are actual holiday characters, with three characters having holiday focused rules, and one just being a snowman. Some of the remaining characters could be stretched to be holiday-ish. For example, the Ghost could be the ghost of Jacob Marley which would pair well with the Boss (who needs to explain why players have to work during the holidays). The Head Chef (who needs to explain the tasty dishes they only make once a year) or the Toymaker could easily choose to focus on the holiday theme but aren’t restricted by it. Characters like that may have been left intentionally vague to make this game easier to play years round, but again, this is supposed to be a holiday edition. A small detail that could have helped reinforce the theme could be to have been to make the necklace beads holiday colours, or maybe made the name tags feel more jolly, the back already says Holiday Judge on it so just go all in. This type of game isn’t for everyone, there’s is an above average amount of spontaneity and improv that several of my more quiet friends just weren’t up for, but the ones that did play really did enjoy it. At the same time, the overall reaction was the same. Fun game, but it’s disappointingly far from a holiday game. 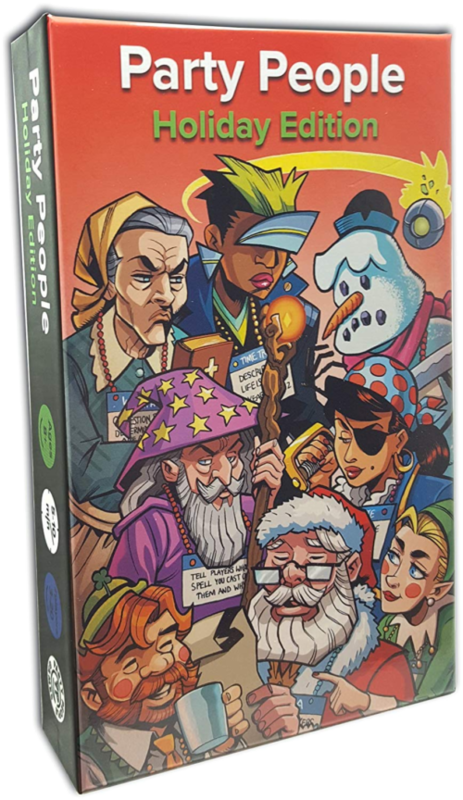 Party People Games has some really neat products, some suitable for age 8+ and others that are specifically aimed at adults, and many of the games can mix and match components like the beads and nametags. With that in mind, some of the design choices made a lot of sense. I want to love this game and rave about it. It’s a fun game and there are other editions available. I would LOVE to see a Holiday Edition 2.0 in the future, one that hopefully commits more fully to the theme, because as good as the game is that shortage of theme was a huge letdown. If you don’t care about that, by all means, pick this up. You can find Party People Games online at partypeoplegames.com or on Facebook at facebook.com/partypeoplegames. Sit back and enjoy this great Christmas performance by Straight No Chaser.